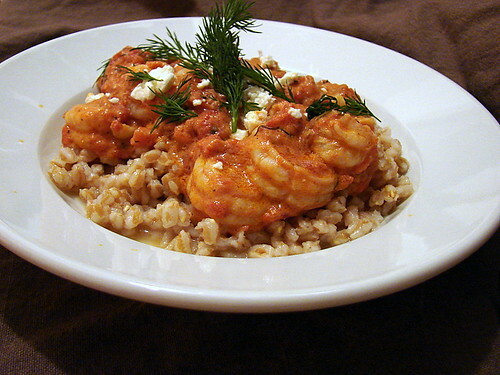 I am generally of the opinion that seafood and cheese don’t go together, but I make an exception for shrimp and feta cheese – there’s just something about the interplay of sweet, crunchy shrimp and briny, tangy feta that is really appealing. Yesterday was Mike’s last day at his old job, and after a couple of rounds of celebratory cocktails (as evidenced by my slightly blurry photos and the spots on the rim of the plate), I was glad I had planned another fast, simple dinner. In fact, I was glad I had planned this meal in particular because it is a dish I hadn’t made in years, at least not in the time Mike and I have been together, and he loved it. This one’s a definite keeper. I smashed and roughly chopped a couple of garlic cloves and added them to a hot pan with some olive oil and a small pinch of kosher salt. Once they were golden and fragrant, I added one large can of diced tomatoes with their juice. I smashed them up a bit with a masher, added a teaspoon of dried oregano, covered the pan and let them come up to a simmer. While the sauce bubbled away, I peeled and deveined half a pound of large gulf shrimp. After the sauce had cooked for 10 minutes or so, I added the juice of one lemon, then stirred in 1/4 cup of crumbled sheep’s milk feta. I let this cook another few minutes, until the feta melted into the sauce, and then I added the shrimp, stirred them through, covered the pan and let it all simmer for a few minutes longer. When the shrimp were just cooked through, I removed the pan from the heat and added some chopped fresh dill. I served this over farro, but it would be just as good over orzo, rice, or couscous. I tried my own variation of this last night and it was delicious! I omitted the lemon juice and used blue cheese crumbles instead of the feta. Thanks for the idea!!! I’m new to your blog and I’m loving it! I made this recipe last night for myself and my husband, and we loved it! Such a great, fresh, and healthy recipe. I’m looking forward to making more of your dishes!